Keep Your Staff Happy with High-Grade Seating! The DIR Medical Stool offers superior versatility & great value for your seating needs as we know comfort is rather essential for both the Medical and Beauty industries. 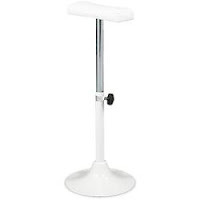 This comfortable stool is adjustable in multiple ways, allowing for the comfort of all of your technicians! 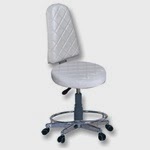 Backrest height & extension adjustment allowing maximum seating area & comfort. Many of the mobile LMT's I've spoken with, have all had one major thing in common - ease of transport. I used to pop my table in the back of my car along with a bag full of linens, lotion, music, clock and more. I wanted to be sure I had everything my room had (minus the hot towel cabi!) to give the best possible on site table massage. The thing I hear the MOST, is how they need an easy to transport stool. This is where my favorite manufacturer of massage products, Earthlite, comes in with the perfect solution. 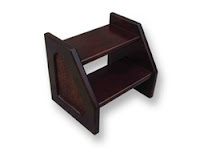 The Folding Massage Stool to match your table. 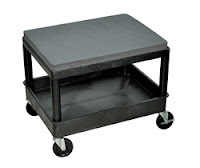 Easy to transport and as durable as any Earthlite table or chair. All for under $100! No more kneeling, squatting or asking clients for something to sit on! Every working man and woman has at some point experienced back pain from overuse, standing too long and the most avoidable cause....an uncomfortable stool. Improper posture is a leading cause of back stress and pain, and you can take steps to prevent it from happening. Aside from the self care techniques you practice along with regular massages, spa treatments and exercise, having a quality comfortable stool should be a priority. Depending on your job, your current back health and preference, there is a stool out there for you. Don't let your back take back seat to comfort with so many options out there!